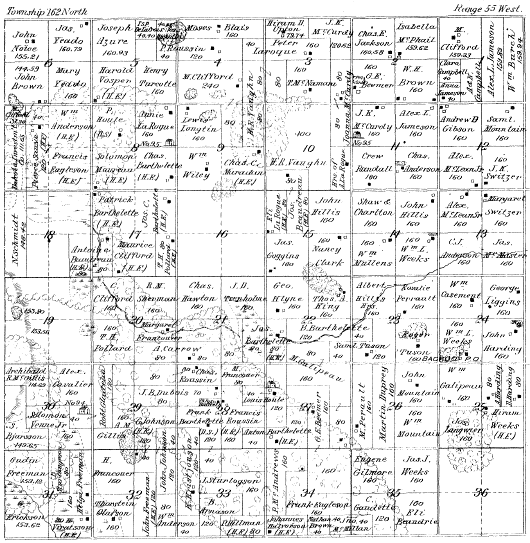 Although this document deals primarly with the Icelandic settlers, the Land Grants data includes the entire township. As with all documents such as this, the research is never complete, nor are the results infallible. As well as being contacted by any reader who wishes to participate in The Dakota Icelanders Project, I would very much like to be informed of any errors in the data presented here. Revisions will be made as necessary. Print versions of this page, as well as many others at this website, are available. 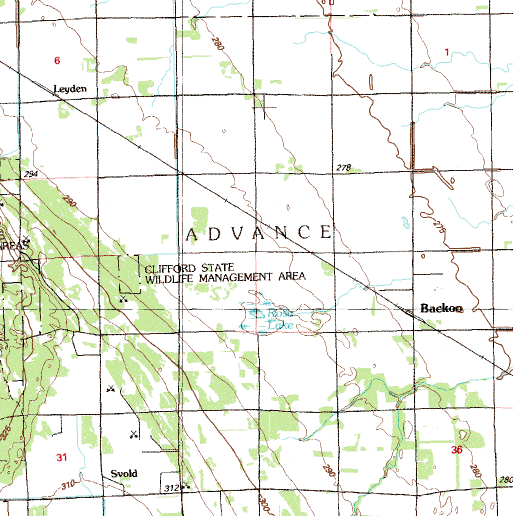 Advance Township is located in northwest Pembina County, North Dakota, the southeast corner about three miles west of Cavalier City. It is bordered on the west by La Moure Township and on the south by Akra Township, the former of which had a number of Icelandic settlers and the latter settled predominantly by Icelanders. For the pioneer settlers, the nearest town was Backoo, five miles northwest of Cavalier. However the village most associated with the early Icelandic settlers was Akra, three miles south of the township border. 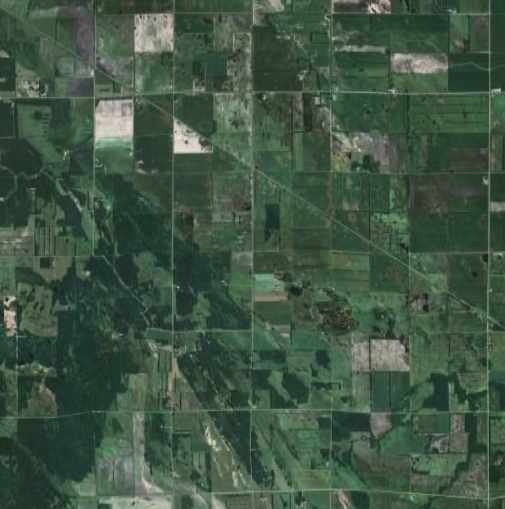 Those in the western portion would have associated with the hamlet of Coulee, later Hallson. The churches associated with this area are Hallson and Peters. Originally the Icelandic settlers here were simply extending north from two of the initial settlement locations, Akra and Hallson, and the area they settled is confined to the lower third (two miles) of the township. Statistically, of the 22,009.67 acres available for homesteading (the total township area is 23,289.67 acres, but two sections, or 1280 acres, were set aside as school land) in Advance Township, 2763.75 acres are known to have been granted to Icelanders. Although Advance is one of the least Icelandic townships in the main Icelandic settlement area, still 12.6% or 1/8 of the land grants were Icelandic. These were concentrated in the southwest, Sections 19 and 28 through 34. And this does indeed define one of the ‘boundaries’ of the Icelandic settlement. This area was still predominantly Icelandic 75 years later. In the early part of the settlement period this was part of a ‘double’ township that included Akra Township to the south. 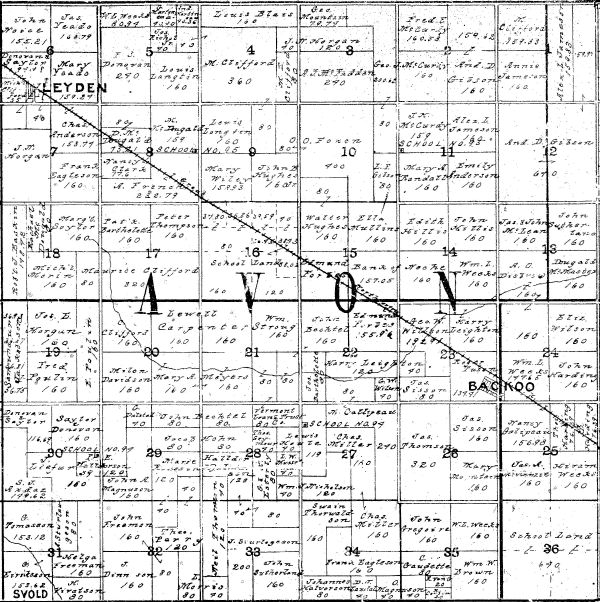 The township was later divided, the south half retaining the original name and the north half taking the name Avon Township, later changed again to Advance Township. 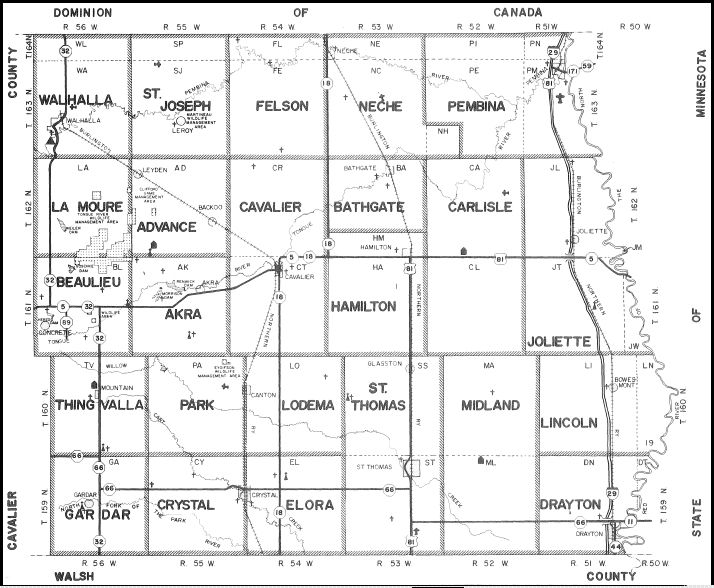 There are currently two publications of the project that include Advance Township: A Summary of the Icelandic Settlers of Advance Township, published in 2002 and The Icelandic Settlers of Northwest Pembina County, 2008 (preliminary). The names in the list below are those of the Icelandic families that are known to have lived in Advance (Avon) Township during any part of the settlement period. They are also the families included in the current version of the settlements books. It would be greatly appreciated if any errors or omissions are communicated to the project. The list below includes the names of people of Icelandic heritage that received land grants. The names, although listed with the spellings I use, are extracted from the full Land Grants Index below. The earliest land grant to an Icelander in Advance (Avon) Township was to Björn Árnason, granted 4 Oct 1884. Later that month Jónas Guðmundsson received his land grant. Note that for practical purposes sorting for people born in Iceland is almost always done by given name rather than by surname. Bjarni Sturlaugsson, 80 acres in Section 31, granted 3 Aug 1896. Björn Árnason, 120 acres in Section 33, granted 4 Oct 1884. Guðmundur Árnason, 120 acres in Sections 32 and 33, granted 1 Nov 1886. Guðmundur Jónsson, 160 acres in Sections 29 and 32, granted 26 Jan 1898. Guðmundur Páll Dalsted, 40 acres in Section 29, granted 10 Aug 1906. Guðni Tómasson, 153.12 acres in Section 31, granted 8 Dec 1888. Halldór Vívatsson, 80 acres in Section 31, granted 23 Feb 1895. Helga Jakobína Ólafsdóttir, 160 acres in Section 31, granted 17 Sep 1890. Jóhannes Halldórsson, 80 acres in Section 34, granted 2 Jun 1900. Jón Jónsson Frímann, 80 acres in Section 32, granted 7 Dec 1899. Jón Jónsson, 160 acres in Sections 29 and 32, granted 8 Dec 1888. Jónas Guðmundsson, 153.62 acres in Section 31, granted 20 Oct 1884. Jónas Sturlaugsson, 160 acres in Section 33, granted 31 Dec 1890. Jónas Sturlaugsson, 320 acres in Section 33, granted 17 May 1905. Kristján Kristjánsson, 160 acres in Sections 28 and 33, granted 18 Feb 1888. Páll Jónsson, 120 acres in Section 33, granted 5 May 1904. Pétur Jónsson Hillman, 80 acres in Section 33, granted 28 Aug 1893. Sæmundur Jakobsson, 147.36 acres in Section 19, granted 10 Aug 1906. Stefán Björnsson Arnason, 149.65 acres in Section 30, granted 5 May 1897. Thorsteinn Jónsson Gauti, 120 acres in Section 28, granted 5 May 1904. Thorsteinn Ólafsson, 160 acres in section 32, granted 19 apr 1890. Guðmundur Árnason, 80 acres in Sections 32 and 33, granted 1 Nov 1886. The tables below includes ALL land grants in Advance (Avon) Township, not just those issued to people of Icelandic heritage. The second table contains the same information as the first, except that it is sorted by date of grant. Names are as entered at the US Bureau of Land Management (BLM). I do not know the reason for the 1776 date, although I suspect it may be that the land was granted under provisions other than the Homestead Act, perhaps simply because of occupancy. Print versions of this page, as well as most others at The Dakota Icelanders Project website, are available. Contact author for details. Click on the name below to contact The Dakota Icelanders Project. Copyright 2009 by Arlan Steinolfson, last revised 5 Mar 2009.